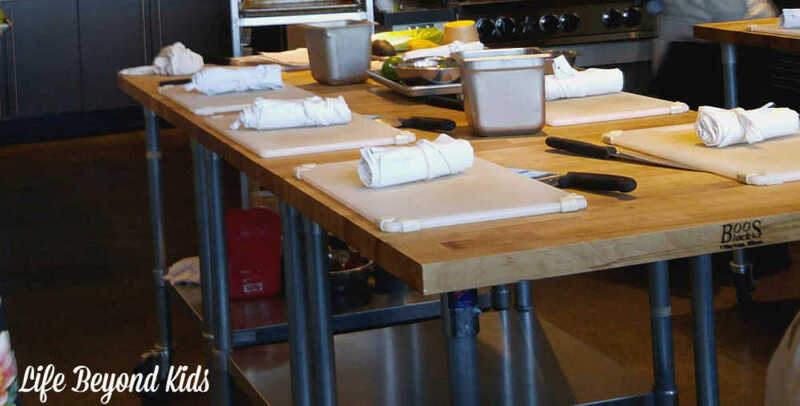 Many thanks to Uncorked Kitchen for hosting a Plant-Based Cooking Class for the Denver Bloggers Club. Permission to share recipes, including Three Sisters Quinoa Salad, was granted by the chef conducting the class. Some of the images were taken by Jenny at Good For You Gluten Free and used here with permission. Finally, affiliate links for items used are present in the post for your shopping convenience. I have always enjoyed having plant-based meals at times. With my switch to gluten-free eating, it has become a little interesting to find things I can have which reduce meat yet do not include something like wheat-based pasta. 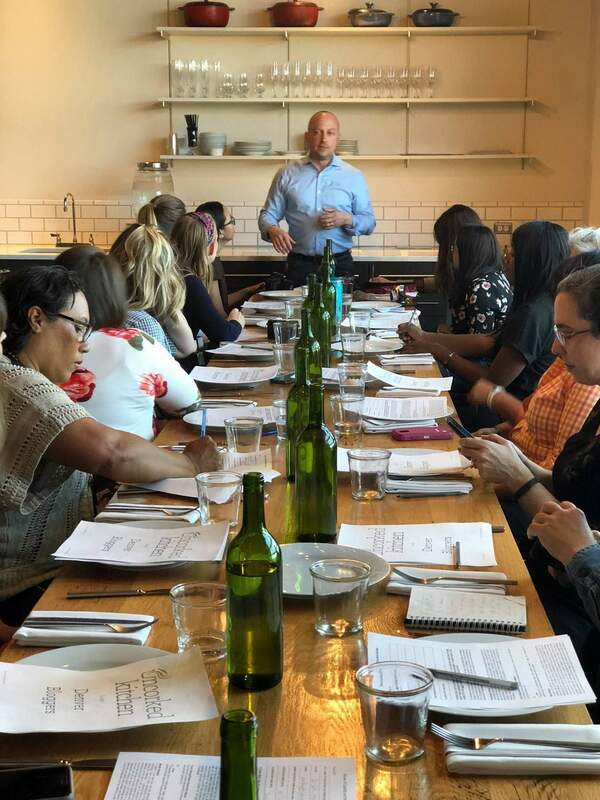 This spring, I was fortunate to be among the Denver Bloggers Club at Uncorked Kitchen in Centennial, CO for a plant-based cooking class. There was no meat in sight, but still plenty of protein and other nutrition in each dish. Listening to more information about Uncorked Kitchen. Photo by Jenny. After we had gathered at the table and filled out waiver forms, we had an introduction to the establishment. This isn’t your typical restaurant as they have a few other areas where they focus: cooking classes and a wine bar. 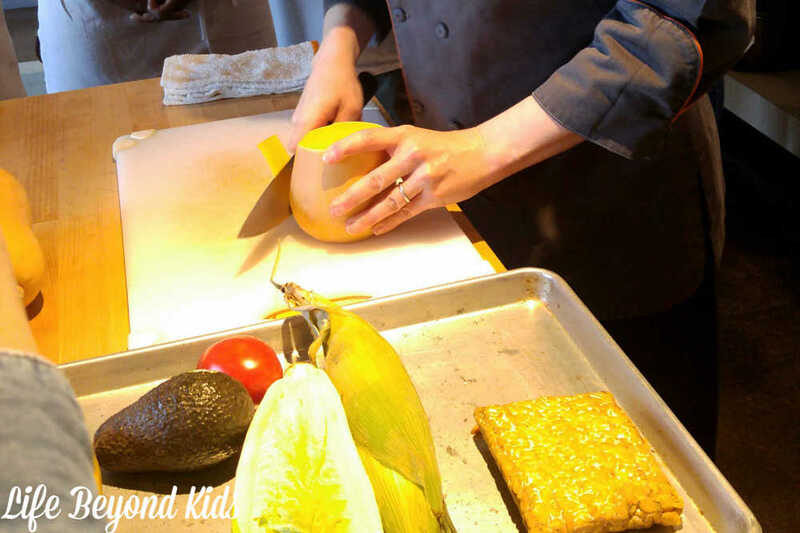 The cooking classes could be for kids, for couples, or around a common food theme. They also have wine tasting nights that sound heavenly. With several of us attending who need to eat gluten-free, they had a separate workspace table where no wheat would show up. As one of the dishes was a sandwich, they purchased a 7-Grain Gluten Free bread for us to use. While all of the dishes were tasty, I especially liked the Three Sisters Quinoa Salad. This dish is not only tasty, but the quinoa is already a complete protein and it is gluten-free! Photo of finished lunch taken by Jenny of Good For You Gluten Free. This recipe was developed by Chef Sarah at Uncorked Kitchen. 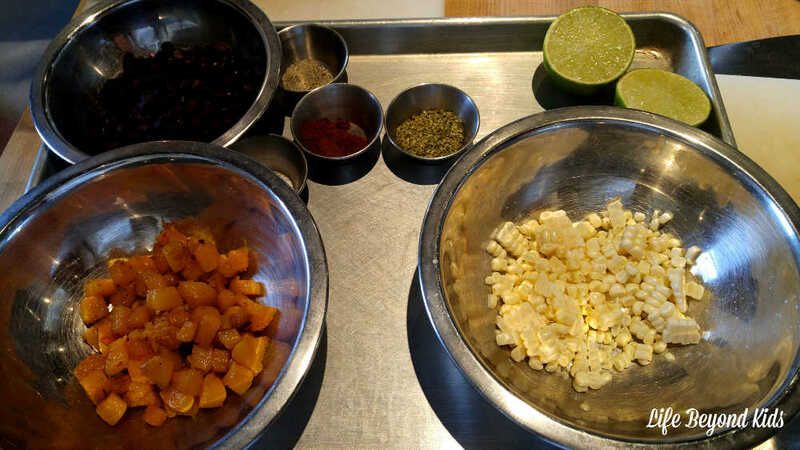 During the class, she shared how you can mix things up to get completely different flavor combinations, too. She also showed us the technique for preparing some of the foods, like the butternut squash in this recipe. Chef Sarah shows how she cubes butternut squash. One thing that this cooking class reminded me of is how important meas en place is when you are cooking. We spent time in our small groups doing the preparations and then went to the stove to cook. Finally, everything was ensembled back at the workstation before we plated our meals. Toss the diced butternut squash with 2 Tbs of olive oil and some salt and pepper. Spread out on a sheet pan and roast until the squash is soft and slightly golden brown. You can stir halfway through cooking time so the pieces cook more evenly. Remove the butternut squash from the pan and allow 15 minutes to chill. Add chili powder, salt, pepper, and oregano and saute until fragrant, about one minute. Add a Tbs of water to the seasoned corn and stir to create a paste. Allow the corn mixture to cool. Add the cooled corn mixture and adjust seasoning to taste. The other dishes we had just may make an appearance on the blog later. Do you eat plant-based meals on a regular basis? What is one of your favorite ways to eat quinoa? This sounds like a delicious dish. I have had some similar kinds of quinoa salad, and it's nice to have such a fresh and healthy dish. Can't wait to make this after I grab some veggies from the farmer's market! I use to be vegan until I gained 40 pounds now I am more of a clean eater. I do still enjoy lots of plant-based meals. I love my Quinoa. I eat it warm with corn salsa. My family loves quinoa! It makes a great side dish. I will have to try this recipe as it looks delicious. A cooking class would be so much fun! I have been wanting to take one with my husband for a date night but never considered how fun it would be to go with my kids. This food looks so good BTW! 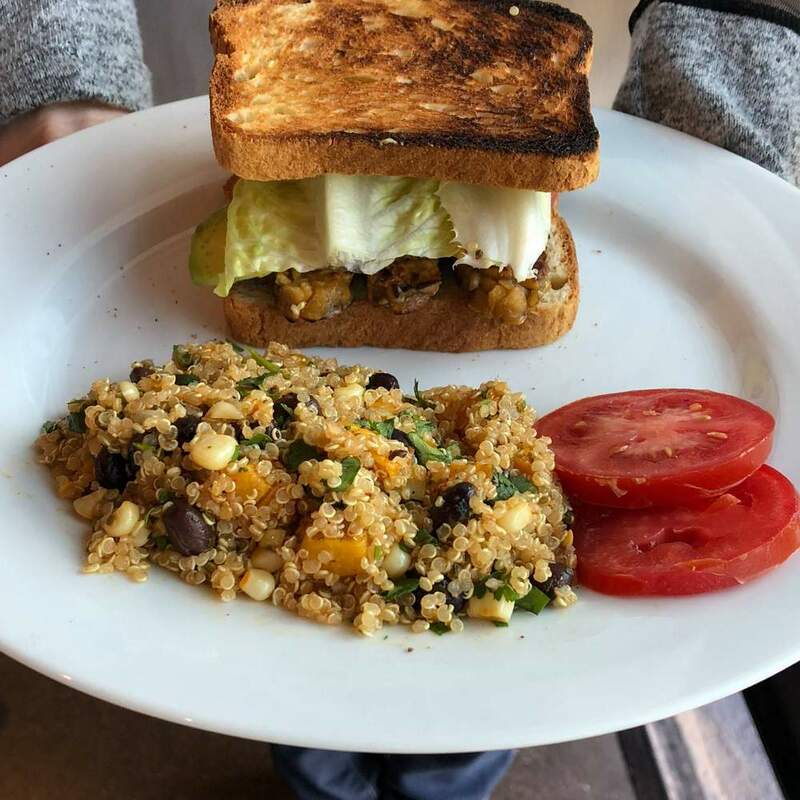 My daughter is a vegetarian and we make a lot of quinoa salads for her, this one looks delicious! Mmmm I need to try out this recipe! We eat plant based meals most days of the week! What a fun experience! We love to eat plant based foods. This looks like a great recipe to try!